For day 6 of 30 days of biking I went for a short morning ride up to Hyde Park. It's my standard short ride and I took it at a fairly leisurely pace. It's a decent route and can be ridden almost entirely off of the busy roads if I choose. 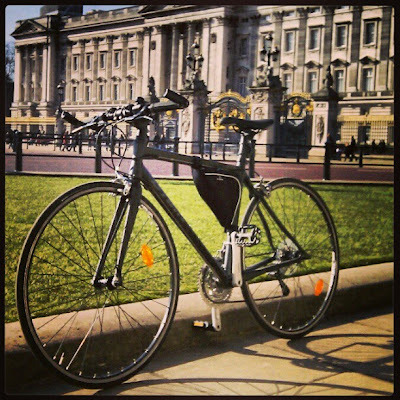 I even stopped outside Buckingham Palace to take a quick snap of the bike in the sunshine. The only issue is that my knee isn't feeling 100% so I might stop riding the bike daily and revert to my normal routine of having a few rest days each week. I'll see how it feels tomorrow and take it from there.